Are you one of those gamers that always wants more... but can't exactly afford to upgrade your PC? Me too! That's why I like to look for the best bang for my buck. 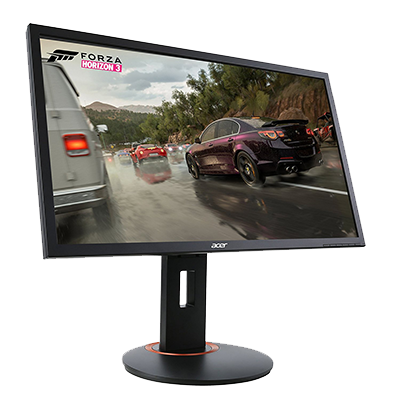 Which is how I came across this wonderful specimen - The Acer XFA240 24" Gaming Monitor! So far, this monitor has been a wonderful addition to my desktop. It is very clean looking, and matches my Acer K242HL very nicely. There is wide range of motion available, allowing for visibility from any angle. I was able to plug this monitor in, and get right to Fortnite. Only to be struck down by someone that gets a shotgun before me. However, for the 15 seconds I was alive, the game never before looked this smooth. The 144Hz refresh rate graciously change the way I play games. Every motion looked so smooth, and there was no screen tearing. If this is what it looks like on an NVIDIA card, then I can only imagine what it must look like for users that use AMD FreeSync. The only downside that I have experienced at this point is that the monitor seems a bit bright. I have tried adjusting the settings, but cannot seem to get it quite right. This could just be me not fully knowing the settings to use though. And does not downplay the other great features of this monitor. Currently, the price is $209.99 USD on Amazon. According to CamelCamelCamel, this is close to the average price of $213.75. If this is in your price range, then now is the time to buy! If you already have this monitor, tell us what you think in the comments below! I always love to hear different opinions on PC tech. Dauntless, The Free Monster Hunter. Incredibles 2 in theaters June 15th!